Residents at Points West Living Slave Lake were treated to a very tasty, ‘green’ St. Patrick’s luncheon on March 15. 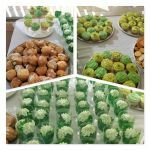 The enviable desserts were created by the newest member of the food services team, and the party gave the community’s newest residents a great taste of PWL living. Residents at Points West Living Slave Lake are looking sharp again with the recent arrival of a new hair stylist. They’ve been making do for the past several months, but are happy they can now keep their hair fresh and trim right in their own community. When Points West Living Slave Lake General Manager Marilyn Badduik started planning the annual ‘staff Christmas party’, she wanted to make it something fun and family focussed; an “old-fashioned Christmas party.” And to Marilyn, who hails from Newfoundland, that means great food, gifts, and games with friendly rivalries and non-stop laughter. 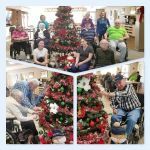 Residents have been busy putting their own stamp on Christmas at Points West Living Slave Lake. A few weeks ago, they decided that PWL Slave Lake was missing ‘decorations from the heart’. So, they planned to change that, starting with the Christmas tree at the front entrance. Residents at Points West Living Slave Lake took the afternoon of Friday, November 9 to prepare for Sunday’s Remembrance Day service. They made poppy-themed decorations, and added poppies to memorial wreaths. A few masks, a witch’s hat, and some silly headbands gave every resident at Points West Living Slave Lake the chance to be in disguise for a few moments during the community’s Halloween party. Most employee care partners wore their costume for the day, and had a friendly competition going for best costume. Residents and care partners at Points West Living Slave Lake were treated to a surprise visit recently from Slave Lake Dental. There were no picks, polish or drills, just some very pleasant ladies who took their break time from the clinic to give back to their community. 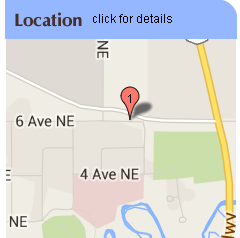 Points West Living Slave Lake celebrated Health Care Aide Day on October 18. In the morning, General Manager Marilyn Badduik, along with Educator Shanika McQueen and recreation coordinator Mailyn Fornoles lent a hand as the HCAs prepared breakfast for residents. In Points West Living communities, the ‘cottage’ is most residents’ home base. The cluster of suites centred around a cottage kitchen is a place where a group of residents and regular employee care partners can develop a real sense of family. That makes it all the more special when the full community gathers, such as at the recent 'Togetherness Party' at Points West Living Slave Lake. In early August, the hydrangea bushes in the courtyard of Points West Living Slave Lake were heavy with big beautiful white flower clusters. There were so many, care partners decided to cut enough to fill vases to place in every cottage. While they were at it, they had a little photo fun.